Child's hand knitted wool cardigan. Boys or girls button up sweater. Hand made using hand dyed wool. 6-12 months, 1 year old's cardigan. Made to order, custom hoodie, bespoke hoody, hooded jumper, sweater, 3 months up to 14 years, babies, children, teen knit bespoke hoodie. This listing is for a custom, hand knitted, wool nappy cover, in your choice of colour(s). This is a one-size-fits-most design and is very, very stretchy. It can be folded down at the waist to fit younger babies and stretches very well to fit over bulkier nappies, so could possibly last from birth to potty training. Your item will be lanolised before posting. Please contact me to discuss your requirements with regard to colours. I have an extensive range of hand dyed yarns (an album can be viewed on my Facebook page https://www.facebook.com/media/set/?set=a.10151147584739512.465968.206615019511&type=3 ) and if I have nothing that catches your eye or imagination then I will happily source something to suit. The pictures shown are examples of past soakers. The 2nd picture shows a pair of longies. 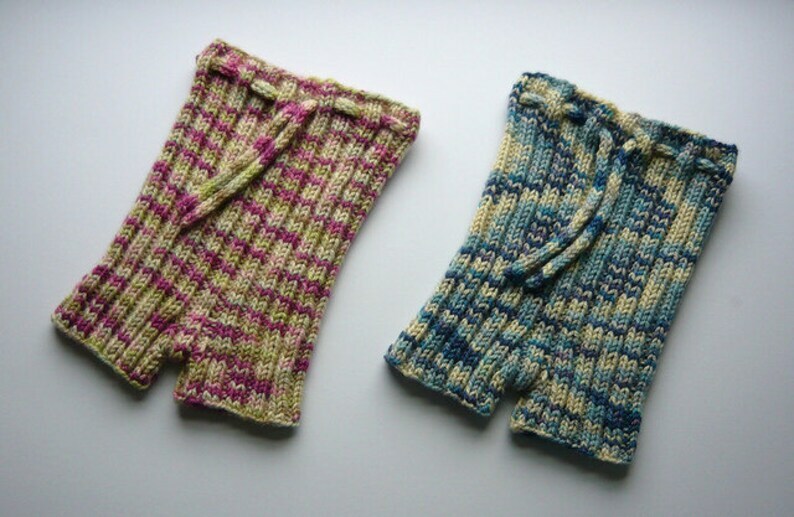 Longies can be knitted up to a leg length (inseam) of 10" using this listing. If you would like longer please get in touch. Please note that the sizing is affected more by leg length, as your child grows, than with a soaker or shorties. Soakers have a 2" leg (unstretched). Shorties have a 4" leg (unstretched). Hand knitted organic merino wool cardigan. Girl's ruffled cardigan. 4-5 years. Handmade with hand dyed yarn. Long sleeved sweater. 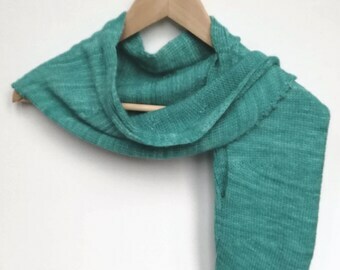 Teal green hand knit wool scarf, hand knitted, hand dyed wool knit scarf. Cashmere and merino blend women's scarf with cabling and picot. Hand knit baby's earflap hat, red, yellow, black, white/natural, baby boy, baby girl, soft, wool, hand knitted from hand dyed wool yarn. Hand knitted girl's dress. Made to order, custom Pixie Play Dress - you pick size and colours. Baby dress, toddler dress, up to 7 years.